In June and July of 2016 I took my 11- and 14-year-old sons Teddy and Tommy on a large, looping road trip from Delaware to Wisconsin and back again. Over nearly three weeks we drove 2400 miles, rode the ferry across Lake Michigan, drove in and out of Canada, listened to Books 1 and 2 of the Harry Potter series, and ate innumerable French fries. For a week in the middle my husband Matt joined us as we hung out with his family; but the rest of the time I was solo parenting (and driving). In a few instances on this journey (hashtag: #momtomted) I was given discounted stays or complimentary tickets to attractions, either by invitation or because I asked. This was true of our first stop, Capon Springs Resort in West Virginia where we stayed for three nights. You can always count on me to tell you when I’ve gotten something for cheap or free and to also share my honest opinions and stories. This is the second installment in my tale of our visit to Capon Springs. Read about our first day there. Our second full day at Capon Springs Resort dawned golden and a bit cooler. Morning began with the usual serenade via the speakers in the trees, a soundtrack that included an instrumental version of the song “Beautiful Dreamer”. We were more punctual this morning and arrived early at the flagpole in front of the Main House where every day a different child can sign up to raise the flag to the recorded strains of the national anthem. I was a bit bemused by the solemn ceremony of it all, but the little girl who raised it that morning beamed as her parents snapped photos and the rest of us stood at attention, our hands over our hearts. Sadly for Teddy, he never did catch anything. 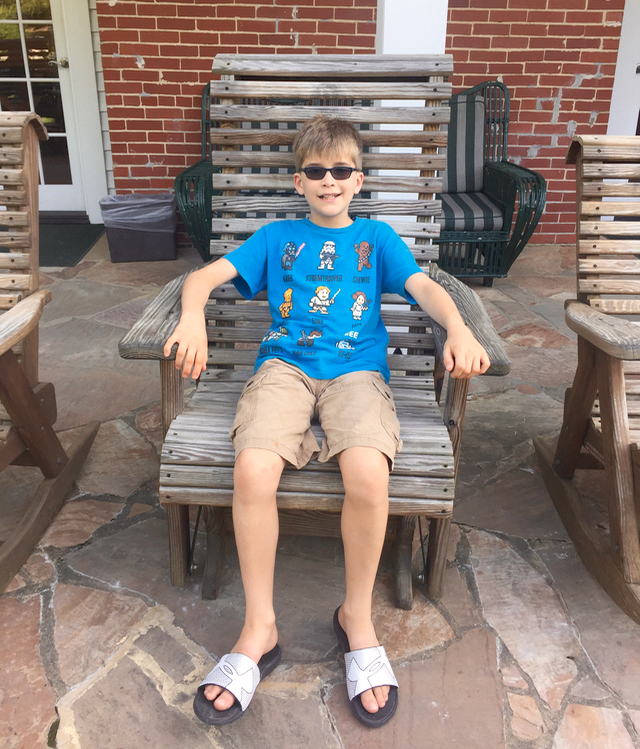 After another hearty breakfast, Teddy, whose sole thought since awakening was to play tour guide to our downstairs neighbors and some other new friends he had made, rounded up his troops importantly at the front desk of the Main House. We gathered some bamboo fishing rods and stale bread to use as bait and marched down to the fish pond. The children were all determined to catch a fish big enough to save (The Capon kitchen staff will cook it and serve it to you if you do) but it seemed that many of these fish had long ago learned to eat the bread without getting caught. 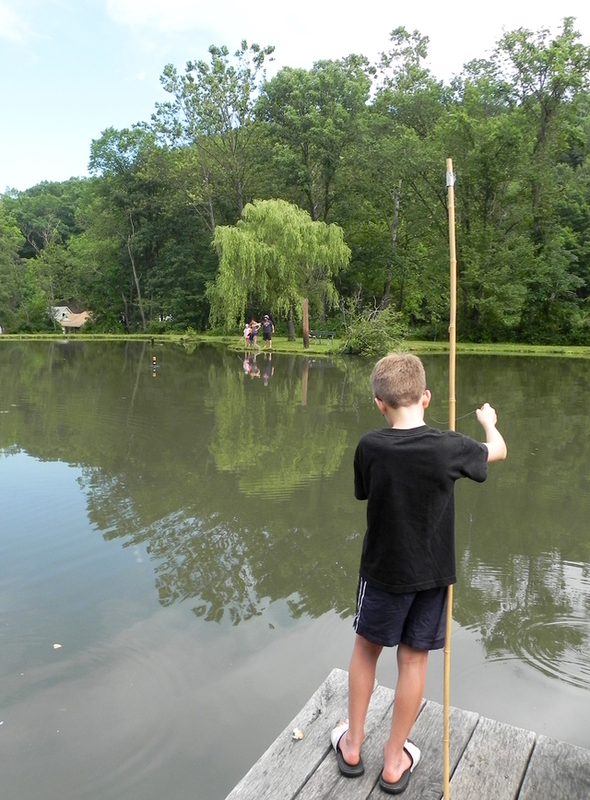 No matter – the children were all delighted to be for-real fishing. Indeed, they fished for much longer than I would have expected, perhaps because the greedy fish were so visible in the water, perhaps because a snapping turtle also came along to see what the party was all about, or perhaps because eventually even the wily fish couldn’t get away and they actually caught a few – although none big enough to keep. 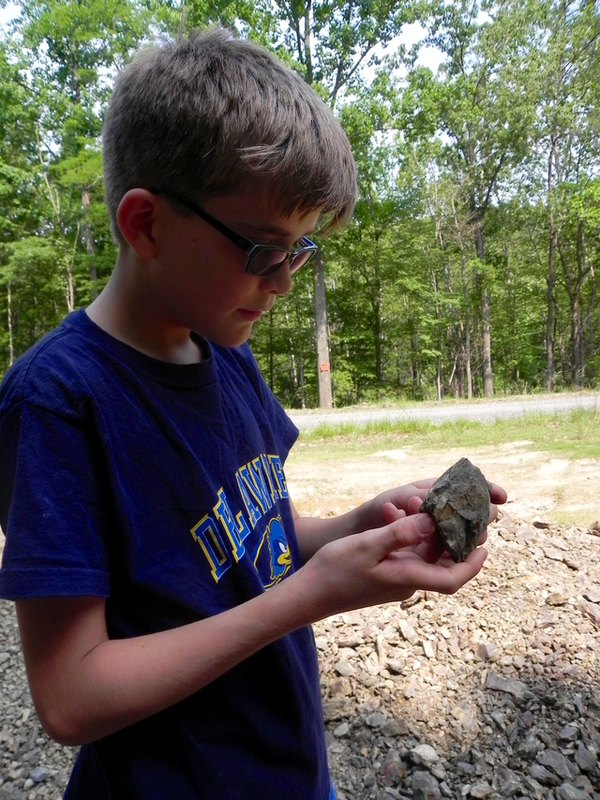 Happily, Teddy was an expert at finding fossils. Capon Springs is a place of easy companionship, and while the younger children fished Tommy played disc golf with the father of the family that was staying downstairs from us. Since he has only daughters, all of whom were fishing, and since Tommy was at that moment without the company his father, the two of them were quite happy with some masculine company. And my arm, which was still sore from the previous day’s perpetual rounds of ping-pong, badminton, and shuffleboard, was grateful for the break. When Teddy led his group of young adventurers to the shale pit where we had spent so much time the previous day, I slipped away and wandered around the peaceful grounds snapping pictures. Our porch had a seat for everyone – and a convenient clothes line. Lunch was chicken a la king – a smart use of leftovers from the previous evening’s barbecue. While we were eating, I noticed that a large group of young people, clearly not Americans – they were speaking Arabic, French, and accented English to each other – had improbably materialized at long table on one side of the dining room. Some of the women wore hijabs and none looked to be older than 25. It may sound strange, but I knew instantly who this mysterious group was, and confirmed it later when I asked a few of them where were from. The State Department runs a program called the U.S.-Middle East Partnership Initiative (MEPI), which works to promote social, economic, and political reform in the Middle East and North Africa. Every summer, about 120 undergraduate students from the region spend six weeks in the United States, where they are spread out over six universities who host them. The University of Delaware, where my husband Matt works, is one of the host schools and often we have invited some of the students for an evening in our home. In fact, I’ve written on this site about having MEPI students as guests at our house. The program includes classes but also some sightseeing so that the students can learn about the United States. This group was studying at Georgetown University. I couldn’t quite believe that they were here, in this old-fashioned and remote place, eating homemade gingerbread and listening to “Chattanooga Choo Choo”. The world suddenly felt very small. Capon Springs offers a number of lovely hikes on trails that surround the cottages and after lunch that day the boys and I drove the twisting dirt road that ascends the mountain at the far end of the resort. As soon as we got past the last few buildings on the resort property we were in the middle of thick woods. 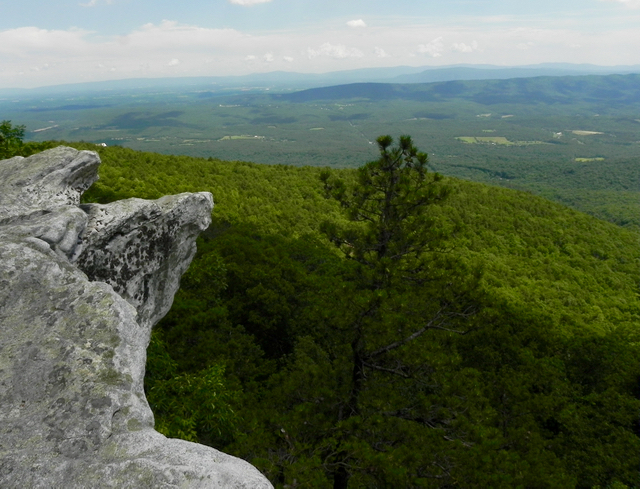 We passed no other cars on the two-mile drive and saw no other people on the easy hike along the ridgeline to Eagle Rock, where we were rewarded with views of the Shenandoah Valley. Eagle Rock is a prime viewing spot at Capon Springs. It was very hard to believe that we were just under 100 miles from the urban sprawl of Washington, DC. There are any number of traditions and activities at Capon Springs, one of them being a mile-long race that’s held each Tuesday afternoon just before the pool is drained and refilled. I had signed all three of us up to participate, and after our hike we arrived suited up and ready to go at the starting line by the Main House. The lovely green is at the heart of Capon Springs Resort. As we circled the resort’s large central green, other guests stood on their porches cheering us on. And of course there was musical accompaniment as well via the speakers. It included (inevitably) the themes from both The Chariots of Fire and Rocky. We looped around under the tall trees, back past the Main House, and up the hill to the Honeymoon Cottage, which is thoughtfully set apart from the other quarters, back down the hill and once again around past our fellow guests, who rocked comfortably in their chairs and offered us still more cheers and applause. Tommy finished first and was rewarded with a jar of homemade blackberry jelly. He cared more about getting over to the pool before it drained, and I couldn’t blame him. What a blessing that cool silky water was. After dinner Tommy and I played some ping-pong and then the boys disappeared to their own happy pursuits. I sat for a spell on the porch in the soft evening light before the sounds of song drew me down the green to find out what was going on. As I strolled down the path I could hear a lovely harmony of male voices singing John Denver’s “Country Road”. Two little girls played together on the large swing across from the Main House, their heads hanging back so that their hair touched the sand underneath, their faces the picture of joy and contentment that I myself felt at that moment. 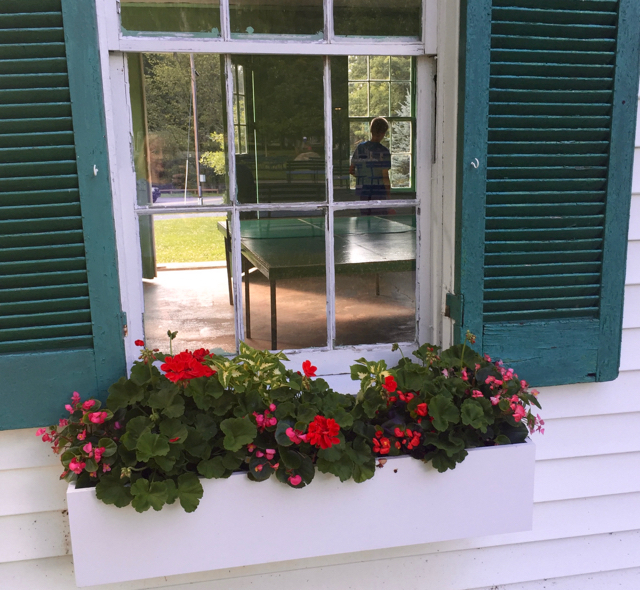 Ping-pong on a summer evening at Capon. I arrived to find a crowd assembled to watch a performance on the porch by a local men’s singing group, all dressed in white polo shirts with large American flags on the front. They stood next to a flag on a stand that they had brought with them and singing sweetly. I saw that Tommy was talking to some of the MEPI students off to the side. Much as I wanted to join them, I instead made my way to a seat where I could listen to “Tura Lura Lura”. This was followed by a medley of Elvis tunes – “Can’t Help Falling in Love” and “Teddy Bear” among them – and a bit of Louis Armstrong, including some trumpet playing. It was a concert that would have pleased my in-laws enormously, and as I looked at the other family groups around me, I had a sudden stab of longing to have both Matt and them there. 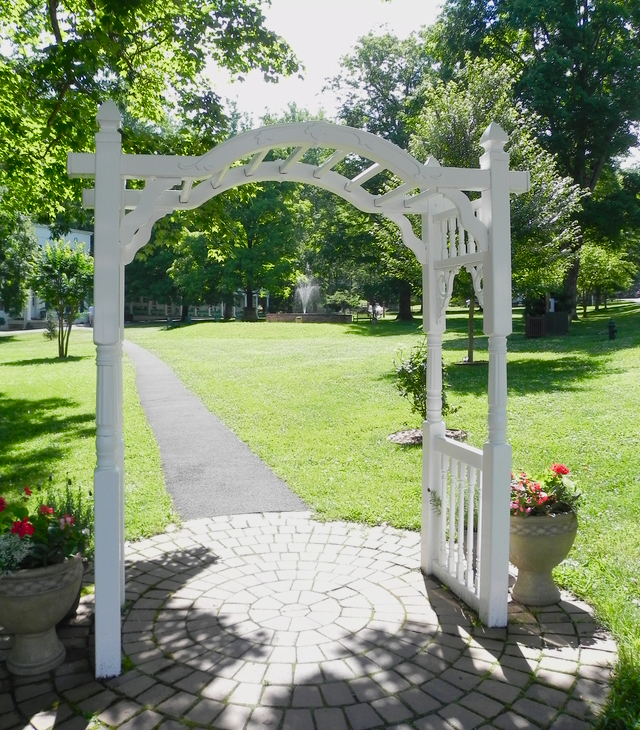 Capon Springs is place that can make you homesick for people you love. As Tommy wandered off in search of his brother, whom he hoped to cajole into playing still more ping-pong, I watched the lightening bugs emerge in the long June twilight and wondered what this bright group of young people thought about the other Americans they encountered at Capon Springs. Did the patriotic songs at the concert bewilder or entertain them? Did they feel like this was a side of America that was new and unfamiliar? Did they like it? Did I? Capon Springs is very invested in remaining true to itself, which is something I mostly love. There are too few places in the world where one can return and know that year after year, season after season, one will find the same rhythms, the same quiet spaces, the same chance to connect with friends and family. This place is precious for that reason alone, and it is also remote and beautiful in a way that completely surprised me because it isn’t that far from the heavily populated Philadelphia to Washington, DC corridor. 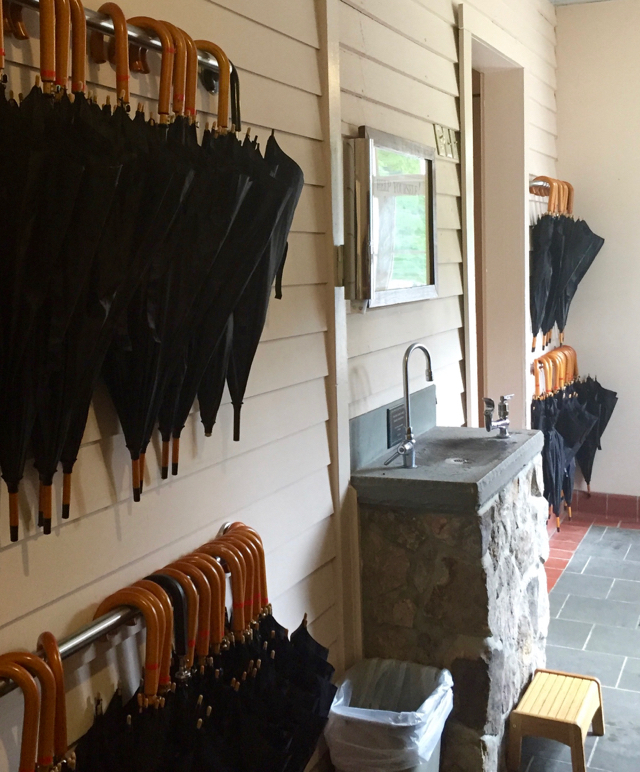 Two of many thoughtful touches at Capon Springs – umbrellas and a water fountain. With that said however, are there a few things I might tweak at Capon? Yes. Some of the food is a bit heavy, plain, and salty, especially on hot days (for example, dinner one evening was hot pea soup followed by roast beef and duck – it didn’t feel much like summer fare). The coffee is weak and doesn’t have great flavor. And the music that is broadcast before meals could be a bit more up to date – I didn’t hear a single song from my parent’s era, let alone my own or the boys’. By the second day Tommy said he was “officially sick of the music” and I’m pretty sure his would be a typical teen opinion. I think it is also true that some people might find the emphasis on American patriotism at Capon Springs to be troubling, particularly at a moment when in the rest of the country we are engaged in some pretty tricky conversations about what it means to be an American and what it means to salute the flag or sing the national anthem. I’ve thought about this a great deal since I was there and can honestly say that I think that the people who own and run Capon Springs mean to show only the best of American hospitality. The fact that they graciously welcomed and accommodated the MEPI students seems to me part of this truth. If the American flag means different and complicated things to the different and complicated population that makes up our country, I think we can all agree that what we would like it to represent is the best of our democracy, which is an openness and acceptance of every person. I saw this at Capon Springs in the warmth and hospitality of the entire staff. It’s a place that wants to care for people and bring them together and I admire that. Our last morning at Capon Springs was full of good-byes to all our new friends. Tommy brought his Caponchase game down to the front desk in search of answers (see my post about our first day at Capon for details about this fun game) and spent a good twenty minutes with Tom Austin, its creator, sorting out what he had and had not completed. We filled our water bottles with one more big dose of that delicious water and said a regretful good-bye to the shuffleboard court. 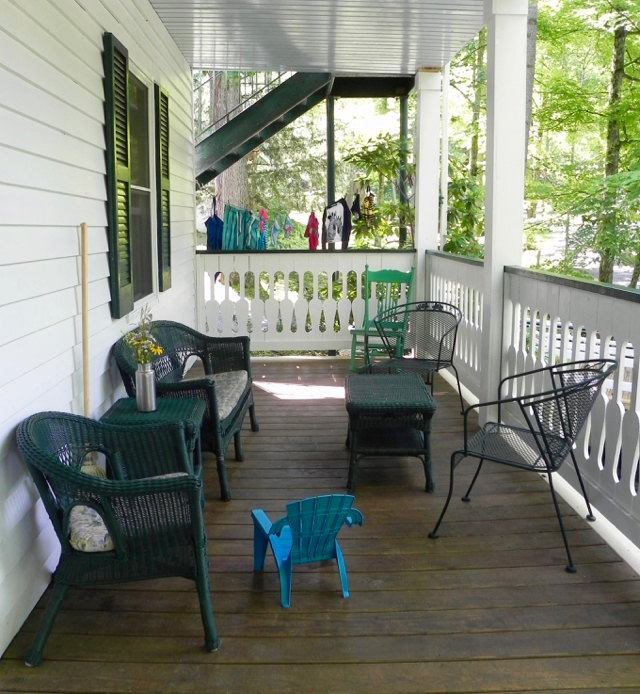 Relaxing on the Main House porch at Capon. And then we drove away from Capon Springs with our minds and hearts full, the email addresses of friends we had made stuffed into my notebook, looking for our next adventure. Interested in a stay at Capon Springs? Find information about making reservations on the Capon Springs Resort website. And stay tuned for the more tales from our #momtomted road trip. Next stop? Pittsburgh. Capon Springs Resort is looking amazing. Thanks for that great post and the beautiful photos.